Here is one of the most desireable Mako CC's out there. Its a 25ft but actually measures over 26 with her beautiful lines. The boat was put away over the last year and has been redone. The hull is navy blue with oyster topsides and brown nonskip floor. The floor transom and stringers are rock solid. The floors were pulled and the tank is good w/ new sending units installed. Every crack or scratch was ground out and filled with glass. Every cleat was pulled and polished/replaced and rebedded. All the teak was redone and shines. The bottom was sanded and barrier coated and painted in Petit Vivid White. The old 1976 135's were sold as they were tired. It can take up to 300hp w/ twins with 20" shafts. I was going to replace with a new O2 Evinrude 225HO with a 25" shaft. It is ready to be rewired w/ your engines and guages. The steering is in great condition. 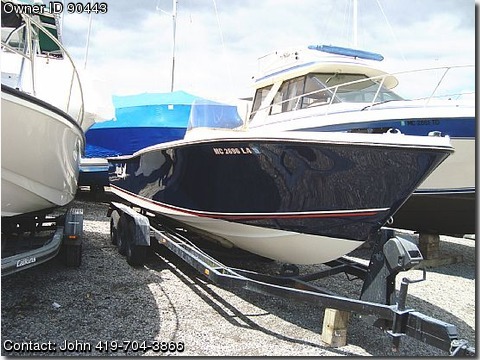 I will sell the hull as is w/o engines for $22K or I will install the new 225 w/ 0hrs for $32K and she will be turnkey ready with all new guages, wiring, binnacle etc. Some of the teak on the console is not on until after the engine and wiring are done but is included. There are new vinyl bow cushions. The trailer is not included but can help loading onto another trailer. Call Jon for details 419-704-3866 $22K hull only $32K finished and turnkey ready.